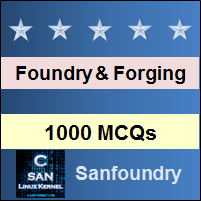 This set of Foundry Multiple Choice Questions & Answers (MCQs) focuses on “Methods of Sand Moulding”. 1. In Bench Molding, the height of the bench can be adjusted. Explanation: In Bench Molding, the light and the heavy moulds can be made. Small and the light molds are prepared on benched. The heavy moulds are molded on the floor but they are cope and the drag are rammed on the benches. Hence, it is said that the height of the bench can be adjusted. 2. Which of the following molding method is not used in foundries? Explanation: The Injection molding process is used for plastic molding. It has no role in the foundry processes and the working materials in foundries are heavier than the plastic. 3. Both Green and Dry Sand Moulds can be made by floor molding. Explanation: Both the medium and large moulds can be made by floor molding. Usually, green sand is used for medium sized castings and dry sand for large castings. Therefore, both the type of moulds can be made by floor molding. 4. In Bench molding, the molder makes the mold while standing. Explanation: The cope and drag are both rammed on bench. The height of the mould can be adjusted. Hence the mould maker has to stand and work on the mould in Bench molding. Explanation: Non-ferrous castings are made by both the type of sand such as Green sand and Dry Sand. These sands are used in the Bench Molding processes. Hence, bench molding is employed in non-ferrous castings. Explanation: Very big castings which cannot be made in flasks are molded in pits dug on the floor. Very large castings can be handled and cast easily through pit molding. In floor molding, the making of such flasks is difficult and not economical. Explanation: When the molten metal is poured into the cope and drag assembly, the metals start getting solidified and the gases are emitted out. Due to the compactness of the sand, the gases find it difficult to go out. Hence it is lined with bricks t=for east escape of the gases. 8. Gates, runners, pouring basin etc are made in ____________ in pit molding. Explanation: The cope (in a separate flask) is rammed over pit (drag) with the pattern position. The cope is an upper part of the assembly where metal is poured in. Hence all these elements are the constituents of the cope. 9. Uniform and consistent castings can be obtained by __________ method in molding. Explanation: As the operations like ramming, rolling of the mould over, withdrawing the pattern etc, are done by the machines, the operations are done faster and identical. Due to this, consistent products are obtained. 10. Which of the following machines is not used in machine molding? Explanation: It is used for manufacturing of Cement. It is used in its manufacturing. Other machine used in machine molding are: Sand Slinger and Jolt and Squeezer machine.